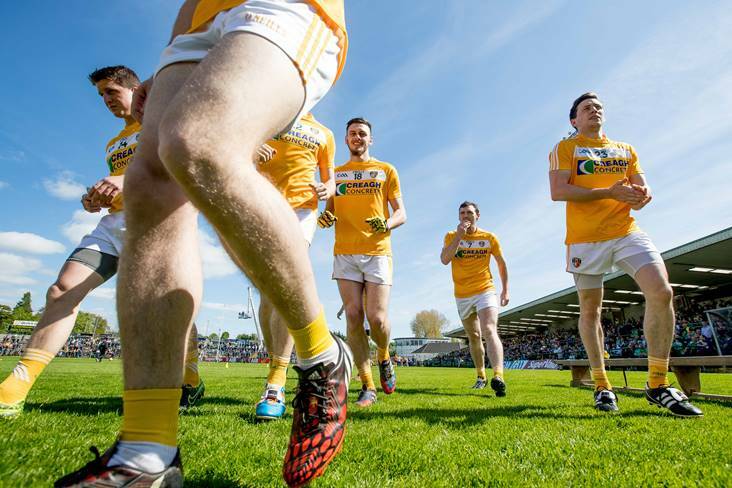 Antrim players break away from the team photograph. ©INPHO/Morgan Treacy. Martin Johnston returns to the Antrim team for tomorrow's Allianz FL meeting with Leitrim in Carrick-on-Shannon. He lines-out at midfield beside Mark Sweeney in what is the only change from the 1-10 to 0-9 defeat to Wexford last weekend. Antrim (Allianz FL v Leitrim): Padraig Nugent; Patick McCormick, Ricky Johnston, Patrick Gallagher; Niall Delargy, Michael McCarry, Declan Lynch; Mark Sweeney, Martin Johnston; Kevin Quinn, Stephen Beatty, Patrick McBride; Colum Duffin, Ruairi McCann (Aghagallon), Ryan Murray. Subs: Andrew Hasson, Eoghan McCabe, Owen McKeown, Fintan Burke, Patrick Finnegan, Matthew Fitzpatrick, Eunan Walsh, Conor Hamill.